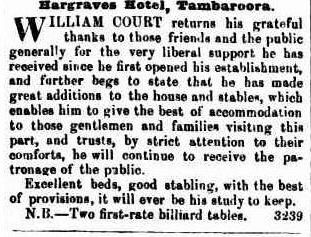 On the 9 Jun 1855 William COURT placed an advertisement in the Maitland Mercury and Hunter River General Advertiser expressing his appreciation for the support he received from the public since opening his establishment. Extracted from the digitised newspaper articles found in Trove, reproduced courtesy of the National Library of Australia. On the 25 Feb 1857 an advertisement appeared in the Bathurst Free Press and Mining Journal for the sale of the hotel. Thomas M. SMITH purchased the Hotel for twenty pounds eight shillings and five pence(121)On the 13 Mar 1858 the new proprietor placed an article in the Empire newspaper advertising the hotel. In 1861 the Crown Lands Alienation Act was introduced, this allowed persons to purchase crown land which they had previously occupied and had made improvements upon. On the 12 December 1863 Thomas Smith purchased Lot 1 Section 9 as a "Grant Upon Purchase of Improved Crown Lands" for twenty pounds eight shillings and five pence. The lot was three roods twenty eight and half perches, and was bounded by Mudgee Road, Albert and Sofala Streets(121). The four images below are part of what formed the Hargraves Hotel complex at Lot 1 Section 9 as per the above newspaper advertisement. 18 April 1867 saw the transfer of the title from Thomas Smith to George HURLEY of Tambaroora who at the time was the licensed publican of the land described on the title(122). (George Hurley was the son of Catherine PALMER by her first marriage, she later became the publican of the hotel). Another title transfer took place on the 31 December 1868 from George Hurley and the mortgagee's John Frazer and William Manson to Robert HICKSON (122) of Tambaroora, a gold miner. (Note that there is a difference between the transfer dates on the Certificates of Title, 31 December 1868 appears on Volume 44 Folio 81 and the 4 February 1869 appears on Volume 80 Folio 62 for this same title transfer). The big mystery to date is when the Hargraves Hotel relocated from Lot 1 Section 9 to Lot 1 Section 4A previously occupied by the Railway Hotel of Harriet Beard, it is interesting to note that no Publican Licenses were issued for the Railway Hotel after 1872. The only dealing was with the new owner in August 1873 advertising the Railway Hotel for lease. The lease was taken up in the same month and the lessee applied for a billard license in 1873. Up until 1873 at least both the Hargraves Hotel at Lot 1 Section 9 and the Railway Hotel at Section 4A were still operating as James DAGGER was also issued a billards license for the Hargraves Hotel(260). 1874 - James Dagger was issued a billards license for the Hargraves Hotel,(261) its location unknown. 1875 saw Lewis Clarke become the proprietor of Section 4A, the certificate of title for his purchase was dated 31 May 1875.(271). The advertisement for the sale of the Hargraves Hotel in 1884 noted its location at Section 4A and that it was leased to James Dagger, so the relocation must have taken place within this time frame. The hotel was put up for sale in 1884, an advertisement appeared in the Sydney Morning Herald dated 29 March 1884, which also noted its location as being within Section 4A. James Dagger of Tambaroora, a Licensed Victualler purchased the premises from Anna Maria Cannell on the 14 June 1884.(271). The hotel closed its doors for the last time in August 1902 due to slackness of trade. As for the Hargraves Hotel chimney, it is in fact the chimney that was positioned on the southern end of the Railway Stores building located next to the Railway Hotel on Lot 1 Section 4A when owned by Harriet Beard. Measurements taken from existing images of the Hargraves Hotel frontage leaves the chimney nearly fifty feet away from the southern end of the Hargraves Hotel building. In a broad sense it could be said that it was a chimney which formed part of the Hargaves Hotel complex but not a chimney from the Hargraves Hotel.